Mothers around the world sometimes face the challenge of protecting their children from unscrupulous people casting spells or directing ill or inappropriate will against their children. Evil eye protection is very well known, but there are other dangers. Though the vast majority of love spells are cast on people who didn’t need that much encouragement in the first place, and are part of natural survival strategy, some don’t come from a place of love at all. Even those who do are sometimes coming from someone you wouldn’t wish on an enemy, much less your offspring. It is a big problem, but not something you want to nag about. You don’t want your kids to be paranoid or to rebel against your cooking. 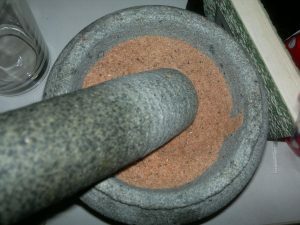 So here are a couple of recipes for seasonings to use in their food so that you can protect them without always talking about it. You can make this for clients as well. Light some incense for your Eshu or your gate keeper. If you are protecting them from a specific type of spells, then bring in the appropriate deities for them too. Pass the container that will contain the salts through the smoke. Will or whispered chants or liturgy. Pass the container through the smoke again, making sure to get some into the container, and then close it. You can keep this in a stealthy container for seasoned salt, or you can make it fancy and mark it with protection symbols. This does not actually have to have a lot of sugar in it, but it is made for sweet dishes. You can use it like cinnamon-sugar for buttered toast and the like, or put less sugar in it to use it as a seasoning in desserts. Use the same directions as for the salts. banishing ill will, breaking a love spell, evil eye, food magic, hex breaking, ill will, protection, spell breaking. Bookmark.